Two years ago I promised myself that before attending the next family reunion I would reserve one of the cabins at Lovewell State Park. As with too many of the promises I’ve made lately, I fell short of fulfilling this one. However, I did stumble across a delightful last-minute alternative. A few days before heading to the reunion site, I booked a room at the S & H Motel in Belleville, an inn with so many online recommendations for its homey touches that I couldn’t pass it up. I knew I wouldn’t be disappointed as soon as I called and began spelling my last name for the lady on the other end of the phone. “Oh, Hon,” she said, “you’re gonna have to go slower than that.” I got three more “Hons” from her before putting down the phone. She had asked when I planned to arrive. I told her that I’d probably be there by 6:00. When I finally pulled into Belleville and stepped up to the counter of the motel at 8:00 p.m. on Saturday, the man who groggily emerged from a door behind it barked, “You’re late. My wife said you’d be here at 6:00,” and then grinned. The S & H is a standard L-shaped motor lodge reminiscent of the 1950’s, with the rooms attractively remodeled and scrubbed spotlessly clean. Although the heater and air conditioner looked as if they may have been original equipment, I can vouch for the workability of the AC unit in room 4. There were two bottles of water in the fridge and a basket of snacks waiting on top of the desk. My basket contained a bag of microwavable popcorn, a pack of peanut butter crackers, and a small honey bun. As I left next morning both members of the husband-and-wife team inquired about about my night’s sleep without a trace of rehearsed corporate politeness. Instead they seemed genuinely delighted that they had done their best to get my day off to a good start. Having missed out on the previous day’s history tour, I set out early to create my own on what was still a comfortably cool June morning. Ever since first hearing about the panoramic camera setting on Apple’s iPhones, I’ve dreamed of using one at the Pawnee Indian Museum and Pike Monument on the crest of a windswept hill overlooking the Republican River. I was borrowing my wife’s phone anyway to use as a remote control for my Keynote presentation on Thomas Lovewell’s life, so I made a jog toward the museum and snapped the photo I’d been dreaming of. A short while after that I got lost. Getting lost is usually considered a mishap, but as my family is painfully aware, I have perfected it into an art form. Making an aimless turn, I met up with the "through trestle" bridge over the White Rock that I remembered from so many trips to Superior in my youth. Not only still standing but looking solid as ever, it seemed to invite me to take its picture, so I did. Getting lost again, I somehow wound up at the Lovewell Marina for breakfast, ordering “The Webber,” two eggs, cheese, and two sausage patties on whole wheat bread, a meal that can stick with you and sustain you all day. A few more photographs and it was back to Willow Shelter to begin day two of the Lovewell Family Reunion. Perhaps because there were two days without a large crowd of unfamiliar faces to get lost in, I spent more time conversing with folks I’ve seen in years past, like Jim Lovewell’s wife Jean, who’s interested in family research and has a circle of fellow enthusiasts around Nevada, Missouri, the girlhood home of professional genealogist (and great-great-granddaughter of William Lovewell) Mary Penner. Probably something in the water there. Dave Lovewell's gait, which may owe its distinctive character to a pair of leg braces that I believe are reminders of his service in Vietnam, seems to be pretty much back to normal after a bone-crunching encounter with an oncoming vehicle on a dirt road last year. Dave provides me with a stream of clues and contacts for stories about family and regional history, which are easily the most memorable features on this site. A day after returning home I got an email from him about a source that shows Thomas Lovewell bidding on mail routes in Territorial Kansas in 1858. Thomas eventually won a bid, though only a small one. Much more to follow about this in coming days. French actress Jeanne Moreau used to say that to have a talk with Orson Welles was to feel like a plant that has been watered. I’m not sure what that feels like, but to have a chat with Patricia Lange is to stand in a wave of so much positive energy that you feel like the center of the universe for at least a moment. There has always been something familiar about Pat and I finally realized what it is. She looks as if someone took my Aunt Ruth, the Logan family historian, and stretched her tall. For many years Ruth was the telephone operator at Formoso, a job she tackled with an eternally sunny disposition and a smile you could actually hear over the phone. And it’s not that Pat physically resembles Ruth in any definable way. You can just see the same wide-eyed eagerness to meet new people and learn new things that Ruth had from the time she first told me about Thomas Lovewell when I was ten years old, until the day she died at age 89. There are also no telltale physical similarities I can detect between Patricia and her sister, Carolyn Simms, except for the fact that I have never caught either one when she wasn’t wearing a smile. I had been heartened on Saturday to meet siblings Orrin Lovewell, Dawn Lovewell Gabel, and Prairie Dawn Lovewell. I’ve talked to Dawn on the phone and read Orrin’s postings years ago on Ancestry message boards, and expected both of them to be older or at least seem older. I actually expected Orrin to be dead. When he suddenly ceased posting messages around ten years back, I assumed he had quietly slipped away after enjoying a long, full life. No, Orrin and his sisters are all bustling with the energy and enthusiasm of the young adults they are. I’ve wondered ever since meeting her whether Prairie Dawn was named after the Muppet or the rose. Either one works. 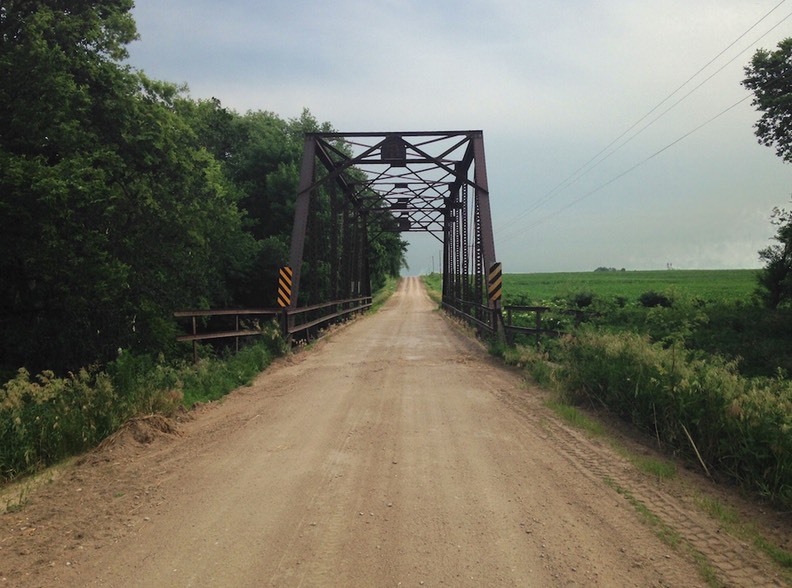 As for Rhoda Lovewell, granddaughter of a Kansas pioneer who was born nearly 200 years ago, seeing her again is still the best reason for going to family reunions. Her hair has finally yielded in its stubborn tussle over the matter of color, settling into an elegant silver that’s very becoming. And that’s not the only struggle drawing to a close. Rhoda’s masterful updating of family lore, “The Lovewell Family Revisited” is all but done. Sample copies were available for thumbing through at the family gathering and it’s an impressive achievement. If I’d had the money in my pocket that day, I’d have plunked it down on the spot. Since Tropical Storm Bill and my car conspired to stage a massive raid on my wallet right before the weekend, Rhoda will have to wait for a check in the mail come payday, or maybe even a second payday. She hasn’t just rewritten, freshened and updated what’s been printed before. Rhoda’s done a tremendous amount of legwork over the past 16 years and must be heaving a sigh of relief. Working alone, she’s had to fill the shoes of two predecessors, her half-sister Orel Poole, whose specialty was family and regional research, and Gloria Lovewell, wife of James Franklin Lovewell, who compiled and distilled myriad sources, and filled in numerous chinks. There were so many highlights I don’t have time to name them all. Just as the reunion got underway, 88-year-old Florence Bauer introduced herself and her 91-year-old husband Don. Florence is the researcher from Hebron, Nebraska, who sent me all those historical Superior Express reprints two years ago. I owe her some more chapters of my book on Thomas Lovewell. 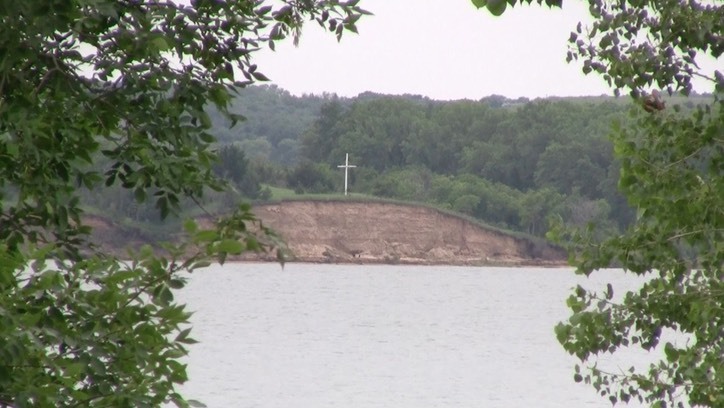 Carolyn Simms told me where to look for the large white cross overlooking a bluff south of Lovewell Lake which marks the spot were victims of the 1867 White Rock Massacre were buried. I finally spotted it and rolled off some footage. It should come as no surprise that I got lost in El Dorado on the way home. Nothing to shoot pictures of there.